Visited Indy for a routine ABI reprogramming session today. Um, surprise: My beloved Nucleus Spectra 22 speech processor (circa 1995) is obsolete. We ordered a Nucleus Freedom (sing it baby…) behind-the-ear (BTE) speech processor. I also get a body-worn processor, but it’s much sleeker than what I have. Kind of like buying a new car with all the color and accessory choices. 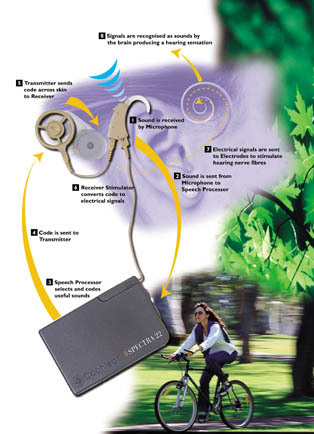 The BTE processor fits over the ear and is rechargeable, or can use three hearing aid batteries for back-up. The bodyworn processor could be concealed in a fist, and uses two AAA batteries. (“about the size of an iPod® Shuffle,” as described by the website and demonstrated by my audiologist–I commented that Cochlear and Apple should have package deals, an opinion strengthened by the description of SmartSound capability.) I’ve been casually contemplating a direct hook into a musical audio source for many years now. Although, I must say, that I did achieve a great deal of background sound masking, for understanding someone right next to me, aided by lipreading, in very noisy environments, using my S/squelch setting. That changed in the last couple years. I’m curious whether the new SP will match or exceed that performance. I’ve been unlike most of my friends with ABIs: I’ve never minded the pocket-sized speech processor or wire going from it to my ear/head for the transmitting coil. While many Cochlear Implant (CI) recipients, and even friends with ABIs in Australia have enjoyed BTE models for years, I was always of the mindset that processing power and performance were far more important than aesthetics. Plus, basically, “I love my ABI,” and all the crazy experiences I’ve had as a result of the sounds it’s restored, and the adventures along the way! It looks like Cochlear may have succeeded in bringing the best of both worlds.